This can lead to serious complications and even new injuries that can derail a fitness program. Since active seniors have different exercise needs than a younger population, it might be difficult to determine what kind of program would best serve them. Can they be well-managed by a personal trainer? Or are they better off with a physical therapist? Personal training is a structured workout program that allows clients to exercise on a regular basis under supervision to maximize results. Personal training is safe for senior clients, with a growing number of personal trainers’ clients coming from the senior population, according to the American College of Sports Medicine Certification. To highlight where personal training ends and physical therapy begins, Karen explains her work with Silver Sneakers, an exercise program designed for active seniors. Physical therapists don’t participate in the fitness activities themselves. However, they do rehabilitate and educate patients who are hurt and return them to their regular routine. By using the AlterG Anti-Gravity Treadmill™, Karen is able to get her seniors back to the program in no time. In addition to being able to get her patients moving with less pain and impact, the treadmill also allows patients to continue their exercise routine. “Our clinic has found Silver Sneakers to be a great program to keep people moving,” she adds. Karen doesn’t recommend that patients use a physical therapist if they’re active seniors without problems. For weight loss, strength building, and fitness maintenance, a personal trainer may actually work best for seniors. “We provide a skilled treatment plan designed to correct dysfunctional movement and return Seniors to their previous level of function, inclusive of a daily workout routine to maintain the gains made during therapy,” she says. Seniors who struggle with pain, balance, and coordination, and who need rehabilitation are best suited for physical therapy. Karen recommends seeing a physical therapist when there’s an existing condition that makes exercise hard. This can also apply to Seniors with neurological disorders like Parkinson’s, another population Karen works with. She finds that using the AlterG works particularly well in these cases since the AlterG differential air pressure system supports patient’s body weight while walking. 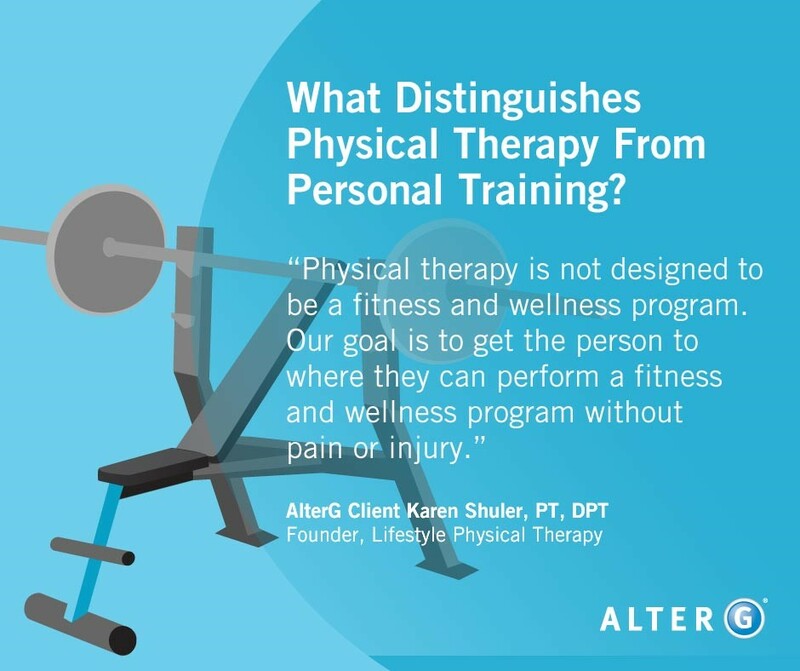 Personal trainers are no replacement for physical therapists and vice versa. However, both have important roles to play in maintaining health as people age. To decide if a patient needs a personal trainer or physical therapist, take into account their fitness level, their health (if their bones or muscles are injured), and their goals (fitness or rehabilitation). Connect with us today to learn more about how the Anti-Gravity Treadmill can help treat your active senior patients who require more support but still need cardio, strength, and flexibility training.